AVENTURA, Fla. -- An unarmed black therapist who was shot in the leg by police last week while protecting his severely autistic client said he had a joyful reunion Thursday with the man, who remains hospitalized because of emotional trauma. Charles Kinsey told reporters outside a South Florida hospital that Arnaldo Rios jumped from his bed and hugged him when he walked into his room for their private meeting. "He is looking well. He is doing really well and he was very happy to see me," said Kinsey. Kinsey was released from the hospital late last week. "He gave me a real big hug and I sat with him for about 10 to 15 minutes," he said. Now walking with a cane and a noticeable limp, Kinsey, 46, said he was determined to see Rios, CBS Miami reported. "When he saw me, he jumped right up and he wanted to cry," said Kinsey, a behavior technician at the facility. Kinsey, a married father of five, was shot by a North Miami police officer last week. He had followed Rios for more than a block trying to get him to return to the group home where he lived and Kinsey works. Police released Thursday a recording of a 911 call from a woman reporting a suicidal man walking down the street. "There is a guy in the middle of the road and he appears to have a gun," she told the operator. "He has it to his head and there is a guy trying to talk him out of it." After giving the operator the location and a description of the pair, she slightly backs off her description of the gun. "The Spanish guy looks like a mentally ill person. I don't know if it is a gun but something that seemed like the shape of a gun. So just be careful. He is sitting in the middle in the road," she said. Police say her description is why officers pointed rifles at the pair. 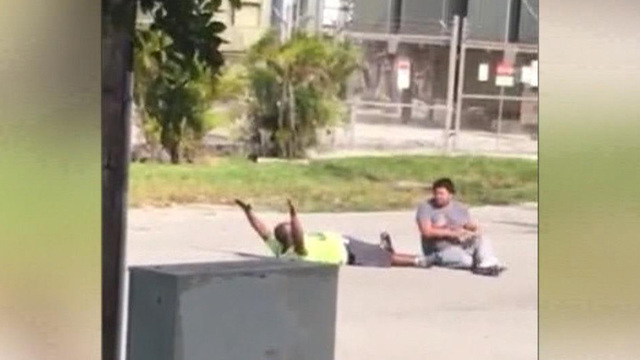 Cellphone video shows Kinsey lying on his back next to Rios with his hands up, screaming at officers that Rios is autistic and that the metal object in his hands was a toy truck. After the video ended, officer Jonathan Aledda fired three shots. Two missed but one struck Kinsey just above his left knee, went through his thigh and exited near his waist. Aledda, who is Hispanic, has been placed on paid leave while the shooting is investigated by the Florida Department of Law Enforcement and local prosecutors. His union says he was firing at Rios thinking the truck was a gun and he was about to shoot Kinsey. Police Cmdr. Emile Hollant is suspended without pay for allegedly fabricating information about the shooting. Kinsey said that he feels fortunate that neither he nor Rios was killed. "My heart is content. As long as he's fine, I'm okay," Kinsey said. But the experience has left him with nightmares, CBS Miami reported. "Mentally, this is disturbing. I play this in my head every day and I can't sleep at night. Things could have went the other way. I am blessed that it didn't," Kinsey said. "I have a big family and if I hadn't made it through, my whole family would have suffered." Because of the shooting, the North Miami department announced Wednesday that it will over the next 90 days increase training for officers on how to deal with people with autism and on de-escalating confrontations. Last week's shooting came amid weeks of violence involving police. Five officers were killed in Dallas three weeks ago and three law enforcement officers were gunned down last week in Baton Rouge, Louisiana. Before those shootings, a black man, Alton Sterling, 37, was fatally shot during a scuffle with two white officers at a convenience store in Baton Rouge. In Minnesota, 32-year-old Philando Castile, who was also black, was shot to death during a traffic stop. Cellphone videos captured Sterling's killing and the aftermath of Castile's shooting, prompting nationwide protests over the treatment of blacks by police. Kinsey's attorney, Hilton Napoleon II, refused to let his client discuss the shooting, saying that could jeopardize the investigation and future litigation. He said he is still talking to North Miami officials about a settlement and is encouraged by the police department's promise to improve training. "The people they have in that city, I know that they genuinely care," Napoleon said. "The reality is that can be difficult when you are dealing with politics and different interests."